I’m a bit biased, I know, but I still think it’s fair to say that indium has a lot of interesting uses – many of which make our lives significantly more enjoyable. From touch screen displays to cooling our computer processors, indium is used every day in ways the general population does not realize. A new use of indium (being developed at Rice University) could improve the well-being of people around the world by removing groundwater contaminants. In the article “Insights into Nitrate Reduction over Indium-Decorated Palladium Nanoparticle Catalysts”, researchers from Rice University and University of Houston describe using palladium nanoparticles coated with indium to reduce harmful nitrates through catalysis. We caught up with Professor Michael Wong and Dr. Kimberly Heck to more fully understand the groundwater nitrate problem, and the role of indium in this new process. According to Professor Wong, nitrates in fertilizers are introduced into groundwater in high concentrations – especially in agricultural regions. Current ion-exchange filtration systems are able to filter most of the nitrates, but do not convert them. When these filters are backwashed, the trapped nitrates are released back into the environment. With the proposed method of water treatment, those filtered nitrates would be broken down into non-toxic N2. The future In-Pd filtration units could be used in place of ion-exchange units, or with them, to convert the nitrate-filled brine. So here’s how this technology works in general terms: Palladium nanoparticles are formed, and coated with a few-atoms-thick layer of indium. As outlined in the article, this indium layer is best when it only coats ~40% of the palladium nanoparticle surface (the palladium surface is still quite important for converting nitrites). 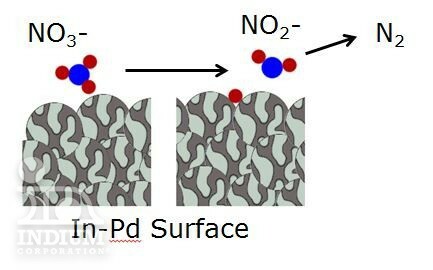 As the contaminated water passes over the In-Pd surface, nitrate molecules lose an oxygen atom and are reduced to nitrites. As the nitrites continue on they react with the exposed palladium surface and (along with the H2 in the water) break into N2 and NH4+. 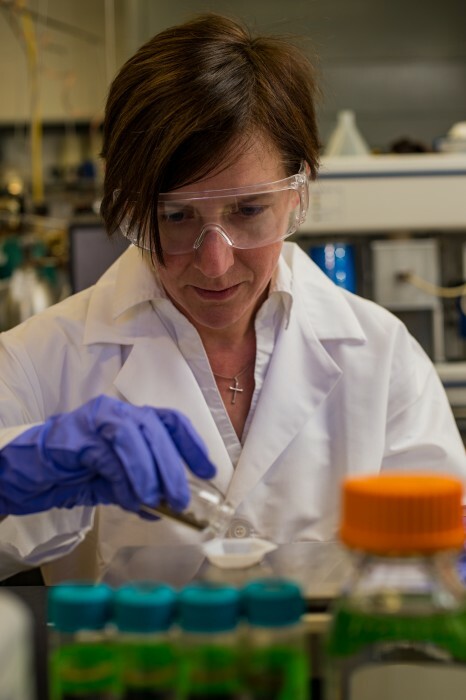 Dr. Heck has been leading the experimentation with these nanoparticle catalysts, looking into the effects of different material sets and efficient deposition windows. She mentioned: “The next big challenge with this technology is scale-up and integration into existing treatment technologies." I’m looking forward to the success of this program and the implementation of the technology to help people around the world obtain clean drinking water. This is one of the most exciting uses of indium I foresee in the near future.